"Distinct among the oldest emblems of Munich, stands out the city seal. In the very beginning, it was a castle gate, with two towers; underneath was a head in a cowl, and over the gate was an eagle, gazing upwards. Later, changes were made, and today it is the full length figure of a little monk, stretching its arms out right merrily, with an expression half jovial, half devout. What further particulars there are about this monk, and whether the city of Munich derives it's name from the word monk, are questions, which have caused much argument and vexation among wiseacres." 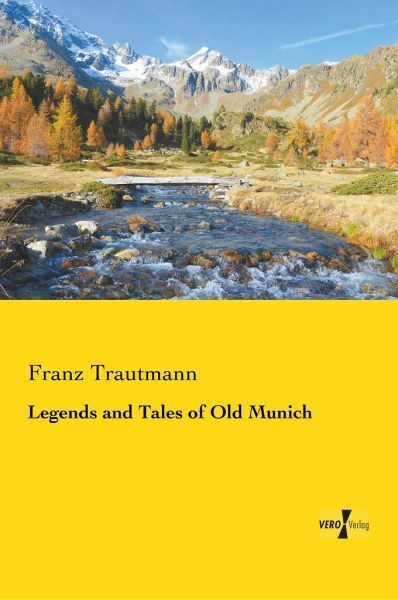 [...] Franz Trautmann was born on March 28th , 1813, in Munich, and died in the same city on November 2nd , 1887. His name is closely associated with the story of old Munich. He it was who interpreted, by written and spoken word, the poetry and chivalrous romance of the Bavarian capital in those contemplative times, now vanished, which he himself in part experienced. In our days of automobiles and air-ships people have changed. But for that very reason it is not only refreshing to be carried back to old times, of which many carefully preserved memorials exist to-day in Munich, but also comprehension, interest and love for the old scenes from which our beautiful Munich rose and expanded are thereby awakened. This wonderful book on tales and legends of old Munich is a reprint of the originial published in 1912.